I’m not sure if I am crazy, or crazy like a fox, but this newfound fountain pen obsession is going to cost me for sure. 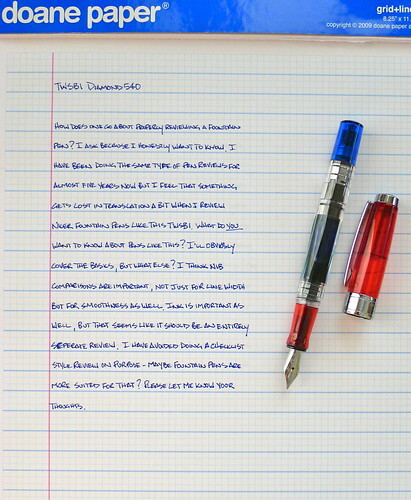 I’ve mentioned on Twitter and on the podcast over the past few weeks that I have purchased a TWSBI Diamond 540 ROC 100 fountain pen and I wanted to share my initial thoughts. TWSBI is a company that many of you outside the fountain pen world may not have heard of. While they have been around for decades as an OEM manufacturer they only recently created their own fountain pen product line. In just a few years time they have become a well respected brand in fountain pen circles. After a few weeks with my Diamond 540 I can see why. If you haven’t already noticed, this is a striking looking pen. The translucent barrel with red and blue sections really pop. It looks as good in person as it does in the pictures. I’m not wild about the faceted cut in the clear mid-section of the barrel (I would have preferred smooth) but it blends in well and I am willing to overlook it. Since I am just starting to spread my wings in the fountain pen world there were a couple of things that took some getting used to. While the Diamond 540 would not be considered a large pen, compared to the Lamy Safari and Pilot Prera it is bigger and more substantial feeling. I would say this is very normal sized compared to most fountain pens. It took me almost no time to get used to. Secondly, the nib is larger physically than any other fountain pen I own. Again, I would say this is more of the norm in the grand scheme of things. I chose an EF nib and it writes wonderfully. It is very smooth and comparable in line width to both the Kaweco and Lamy EF nibs. I was a little concerned as to how the piston filling system was going to work for me but it couldn’t possible be any easier to use. A quick dip and a twist and I was ready to write in a matter of seconds. I love how I can see the ink sloshing around in the barrel. The TWSBI Diamond 540 is going to get a lot of use around the house and would be a good choice as my ink testing pen. I will have to see how easy it is to clean - my guess is not too difficult. From what I have experienced in my limited TWSBI use I am very pleased with their products. Looking through their various lines I can see myself purchasing several other pens in the future. Are there any other TWSBI fans out there? I would love to hear about your experiences and your favorite TWSBI models so please let me know! Posted on May 25, 2012 by Brad Dowdy and filed under Fountain Pens, Pen Reviews, TWSBI.